How To Negotiate Prices In Vietnam? Han Market Da Nang Clothing Quality? Brand Name Shopping In Da Nang Real? Headed to Vietnam? If so, your first or last stop should be in Da Nang! At Han Market, you can get designer clothing at 90% off the retail price in the United States. Most of the clothes were sold between $1-$4 USD without having to negotiate. Many of the shops had prices displayed so you didn’t have to play the “negotiate the price” game. I went through 6 shirts in 3 days. It’s hot and humid in Vietnam. You will sweat a lot! To stay cool, I’d try to remember how it felt to be cold like at the underground amusement park Salina Turda. and when I was freezing at the top of Mt. Fuji (sort of). A friend recommended picking up some dry-fit shirts so I’m not just walking around in my sweat soaked shirt all day. That’s when I found Han Market! Han Market should be your first stop in Vietnam if you’re planning on not bringing much clothes and luggage, since you can buy everything you need at Han Market DaNang for super cheap. They have shoes, hats, watches, jewelry, toys, souvenirs all types of clothes for men/women, fabric shops, custom tailors and food stalls and a local market! 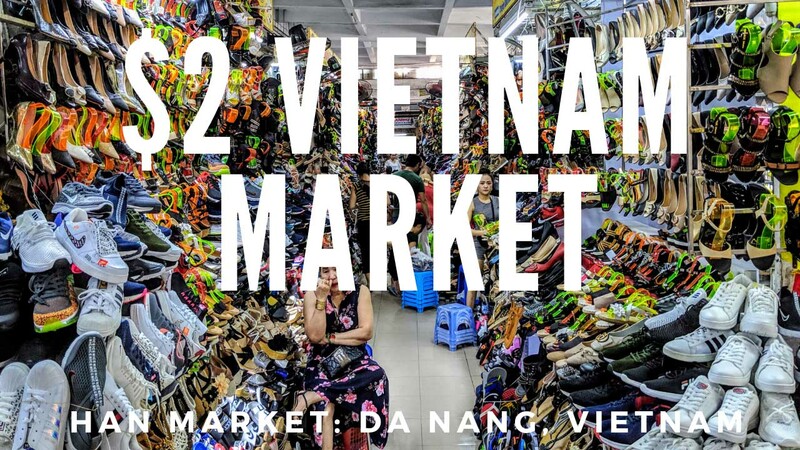 If you’re planning on doing a lot of shopping in DaNang, this should be your last stop in Vietnam so you don’t have to carry your purchases with you as you travel around Vietnam. The prices in Vietnam’s Han Market was very transparent. They would have signs for the prices and those prices would be consistent among other shops carrying the same or similar goods. Prices for clothing ranged from $2-3 USD. At prices that low, I wouldn’t bother negotiating since that would just come out of seller’s commission. That $1 USD means a lot more in Vietnam than it does in the United States. BUT! You may run into some vendors where the price is not transparent. If the price is seems unreasonable, definitely negotiate. When negotiating, offer 30% of what they are asking and try to fish for their lowest price. Even if they come to a low price, still don’t buy it. Since a lot of the places sell similar goods, try that tactic at a few more places. That should give you a sense of what the going rate for the item is so you can come to a fair price. It can be hit or miss. You can inspect your items before purchasing them, I did not. I bought 7 articles of clothing and 3 were of poor quality. There were many loose threads and poor stitching. The other items I bought were in PERFECT condition. It was of quality I’d expect at a retail store. Four of the shirts I bought at the Da Nang Shopping Mall were Nike Dri-Fit shirts for 70k VND ($3.02 USD). That same shirts goes for $35 at the Official Nike Store and $30 on Amazon! From those 4 shirts I bought, 3 were in perfect condition. Even if only 1 shirt was good, that’s still less than half of what I would have paid in the US. Definitely. Some of the items I bought were at the same quality of a legitimate store. Big brands like Nike, Adidas, Under Armour have their clothing manufactured in Vietnam due to the low costs. It wouldn’t be surprising if items disappeared from the factory and appeared at Han Market. The few low quality items I bought were probably from the factory’s rejected pile. I saw a Chinese style shirt with a gold dragon on it, so of course I bought it. It was 200k VND ($8.61 USD). Since I was on my way to the airport, I just wore that shirt. My flight on Viet Jet to Hanoi ended up being delayed so I walked around the airport. I found a clothing shop that sold the exact same shirt I was wearing with a sticker price of 600k VND ($25.82 USD). As you can see by the photo, I’m very happy about my purchase. From what I could tell, everything was cash only. You’ll see that throughout most places in Vietnam. If you need some cash, there is an ATM directly across the street from Han Da Nang Market. You’ll find a few more ATM’s in just about any direction from Han shopping mall DaNang. Personally, I rarely do any shopping. But I was surprised by the quality and the prices while shopping in Da Nang at Han Market. I initially came to Vietnam with just one backpack not planning on buying anything. I left with full backpacks. Prices in Vietnam are generally very low when it came to shopping, food and getting around. So if you go to Vietnam for shopping then that’s well worth the trip. The actual name of the building is Chợ Hàn so look out for that.